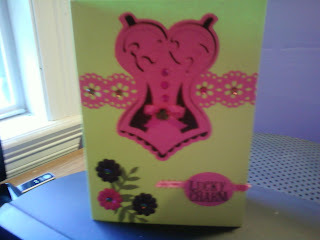 I created this card for the challenge over at My Pink Stamper Challenge. You were to create something using the colors pink (of course), green, and black. 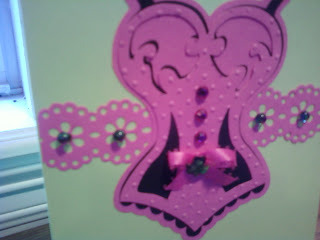 Close up of the corset which I cut at 4" then cuttlebugged with the swiss dots folder. I used Recollections hot pink rhinestones for buttons, hot pink offray ribbon from Michael's, and a Recollections shamrock for the center of the bow. Border is a MS doily lace trim punch and Recollections Pearl sticker for the centers of the flowers. All papers are Recollections card stock, cricut cartridge used is sweethearts, the pink and black flowers are from Recollections also and the title is rubons from K and Company. These are beautiful:) I wish I had your eye for color. I love your blog, Just found it today, Think I'm gonna make a pot of coffee, I'll be here most of the night. Your creations are all so gorgeous I can't pick a favorite.